The other thread ended up with a bit too much discussion on the topic of astrophotography and the related gear. Figured a new, clean one, dedicated just to the imagery, would be good. Here are some of my images, produced with some dedicated astrophotography equipment (german equatorial tracking mount, or GEM, guiding telescope and camera, etc.) All of these were created from mid Feb. 2014 through the end of March. 2014. This is incredible stuff mate, I’m dying to try this genre of photography, but last time we had no moon (last weekend) there was a sand/dust storm and the sky was obscured. The image of the M101 galaxy is stunning, could you share how you achieved this photograph? I would love to have a bash! Ohh, I have the Google Sky Map app on my phone, so I can at least spot the general direction of the galaxies etc! hopefully we can keep this topic free of astrophotography gear and technique related discussion, and just keep it on the images. @TheJock: Check out the other thread. I've provided a lot of information on the kind of equipment you'll need to get started. We can continue the discussion there. Beautiful Sir! Someday, I dream also to take one. Keep posting these excellent work of yours. We finally had a couple of clear nights the last two nights here in Colorado. These are the first since the lunar eclipse some five weeks ago now. 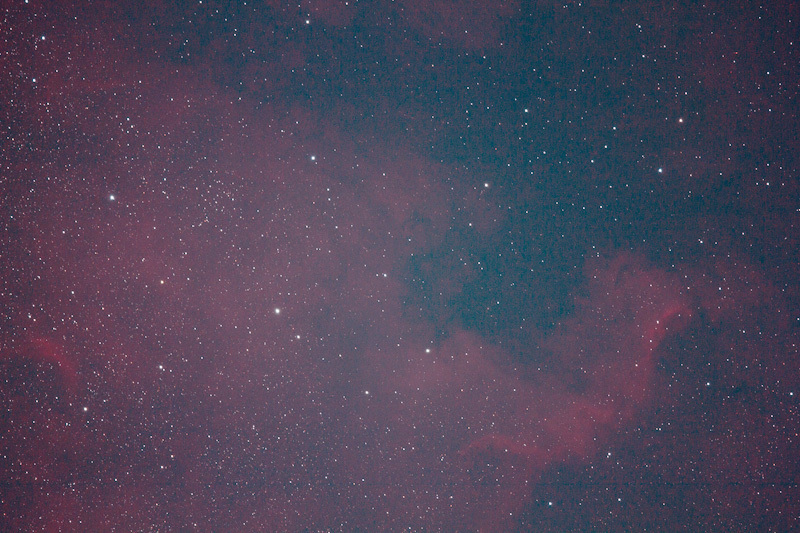 Gave me the opportunity to image part of the North America nebula in Cygnus. You've posted some incredible photographs! My favorite is the horse head nebula. Bravo and please post more when you can. Living up in the Northwest, our availability of clear weather is limited to the summer, and then we have a lot of light contamination from Spokane, starting about 10 miles South of us. We are in the country, as far as the neighborhood, but not away from the city light. I've been up in Northern British Columbia, 100 miles from anything but tiny villages, and its truly amazing what you can see on a clear night. Astrophotography would be a great hobby up there. Light pollution doesn't have to be a problem these days. I actually shot this only a few miles from Denver, CO. The trick is using a light pollution filter. They don't work as well for galaxies (which are mostly stars, so broad band emissions), but for nebula (which are narrow band emissions), they work wonders. I use the Astronomik CLS, which is one of the better ones for blocking pollutant bands. All of my images were shot under light polluted skies using the Astronomik filter. I'm under a yellow zone that, depending on the atmospheric particulates, often turns into an orange zone (I generally judge by whether I can see the milky way or not...if I can faintly see it, then my LP conditions are more yellow-zone, if not, then orange zone. Either way, with an LP filter, you can image under heavily light polluted skies. I know many people who image under white zones. I agree, though, it's amazing what you can see under dark skies. There is one spot in the north western corner of Colorado that is 100% free of LP of any kind. I want to get up there sometime and see what it's like. You can very clearly see the milky way, so clearly that all the dust lanes show up to the naked eye, and all the larger Messier objects (like Andromeda, Triangulum, etc.) is also visible to the naked eye. Absolutely astonishing work. I am cuurently vacationing on a small island in northern Fiji and wish you could all experience 0 LP. Its amazing what the naked eye can see. Unfortunately my hard drive died so I can post photo,s. @Kahuna, I bet the sky out there is AMAZING! I'm quite envious. I barely remember dark skies as a kid, when LP was much less than it is today, and when we lived pretty far out of town. But I wasn't as observant of the details back then. I really don't even remember what the summer sky milky way looks like under a truly dark sky. Even if you don't have a camera, you still have eyeballs and a brain! Remember those nights! As for advice, that is probably best left for another thread. Start one, PM me the link, and I'll offer the best bits of advice I have. M109 in Ursa Major, most distant of the Messier objects. Superb image of the North America Nebula! (NGC 7000) But could you explain how the nebula "looks" like the continent? ??? Because I can't really see any resemblance between the 2. Can I post stuff here if it wasn't taken with a Canon? I've been doing astrophotography for a few years now. These are taken with a 530mm f/5 telescope, and a camera with a KAF-16803 sensor (4096x4096, 9µm pixel). Does anyone have any image samples from a single exposure of deep sky astrophotography, compared with say 60 or 150 or whatever images including dark frames of the same scene? I'm wondering how big of a difference spending all that extra time takes. Many of the images I see are stunning, and I'd like to make my own similar ones, but I'd rather have 70% of the quality and only have to do one image and very little time post processing than 100% quality but hours upon hours of work (not to mention wear and tear on the shutter and mirror mechanism). Thank you in advance. Just hoping to see if it's worth it for me to get into this discipline! Soulless, here are three samples of the same single light frame. Note that the first two have been downsampled by a factor of 6.5x, which has the effect of SIGNIFICANTLY reducing noise. 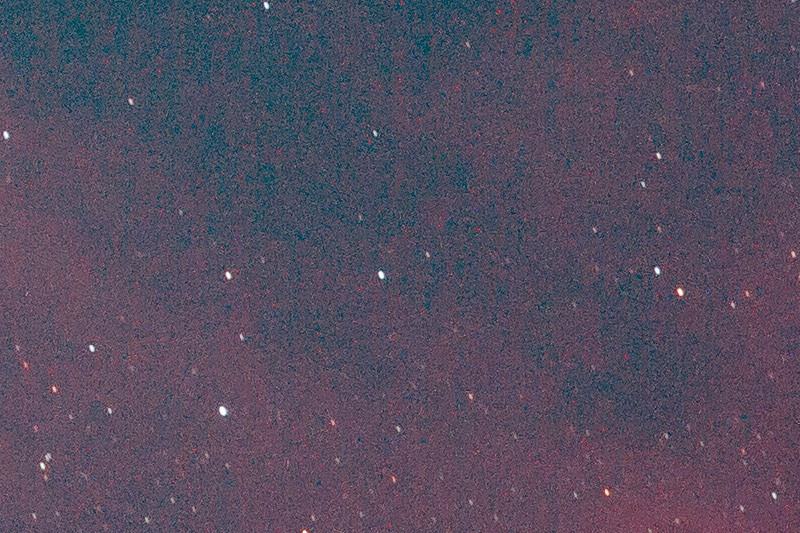 I've included a 1:1 crop to show how much noise there is in one single frame. It is the noise levels that are the primary reason why you really have to take 50, 80, 100 frames and stack them...it's the only way to reduce noise to manageable levels with a DSLR. With Cooled CCD cameras like Bradbury's KAF-16803, you have significantly less dark current noise due to the sensor being cooled by some -50°C relative to ambient, and less read noise. You don't need to stack as many subs to get a good result with a dedicated CCD, however you DO still need to stack. The last sample here, a you can see, has a completely unacceptable level of noise. The amount of noise drops as the square root of the frames stacked. So, to reduce the noise by a factor of two, you need to stack four subs. However, there is a LOT of noise in a single frame, a 2x reduction in noise isn't remotely close enough. To get a 3x reduction, you need nine frames...to get a 4x reduction, you need 16 frames....to get a 5x reduction in noise, you need at least 25 frames. If you are using a thermally regulated CCD, 25 frames might be getting to the point where noise is low enough to be acceptable..."MIGHT BE GETTING TO". For a DSLR, 25 frames is never enough (even when the outside nighttime temps are around 0°C). At 50 frames, you reduce noise by 7x. In my experience and opinion, for a DSLR like the 7D at spring and fall nighttime temperatures, 50 frames is the MINIMUM. During summer nighttime temps, at least 81 frames, but 100 (a full 10x reduction in noise) is preferable. I effectively need to double my exposures to reduce the noise in my North America nebula to a level I would deem acceptable and aesthetically pleasing. My first 4th and currently best AP image I've made, and the first with a mount! Just think about how much better these photos would be with more dynamic range! Oh wait...wrong thread again. Damn.